At the beginning of each growing season, as leaves and buds begin to emerge, crops will be susceptible to frost damage. 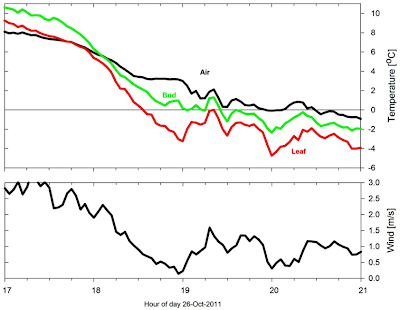 On clear, calm nights, leaf and bud temperature can drop below freezing even if air temperature remains slightly above 0 °C (see Figure 1 below). This is called a radiation frost and is due to the lack of air mixing (wind) near the surface, and a negative net longwave radiation balance at the surface (more longwave radiation is being emitted from the surface than what the surface is absorbing from the clear sky). Under cloudy and/or windy conditions, radiation frost events do not occur. 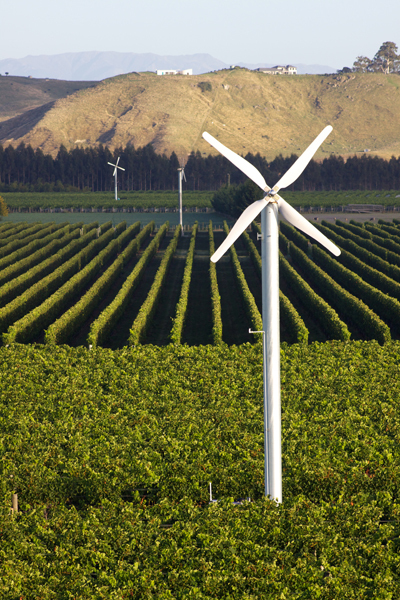 Growers have options for mitigating damage caused by radiation frost, for example, heaters and wind machines to heat and mix the air within the crop canopy. Although these preventative measures are effective, they are also expensive to operate, requiring significant amounts of fuel and/or electricity. Historically, growers have depended on air temperature measurements and weather forecasting to determine the need to initiate frost protection measures. Air temperature can be misleading because the same atmospheric conditions that cause radiation frost also cause crop temperature to drop below air temperature, but not always by the same amount . Forecasting requires use of a surface energy balance model with multiple measurement inputs  . An estimate of crop temperature, based on a direct temperature measurement, is a simpler, more straightforward method of accurately determining when crop temperatures drop below the freezing point. Apogee Instruments is pleased to announce the release of our radiation frost detection sensor, the SF-110. The SF-110 is a combination of two temperature sensors (precision thermistors) in a single housing. One sensor is designed to mimic a plant leaf and the other a flower bud. The SF-110 provides close approximations to leaf and bud temperatures and can be used for prediction of frost on leaves and buds. The temperature measurement range of the SF-110 is -40 to +70 °C with an accuracy of ± 0.1 °C from 0 to +70 °C. However, the sensor is intended for applications in cropped fields and orchards when temperatures will be near freezing, and where air temperature measurements are not a good predictor of frost formation (Figure 1). The SF-110 offers a simple and effective method of helping growers determine when to initiate expensive frost protection measures, thereby saving crops in addition to operating costs. For more information on the SF-110 please click here. 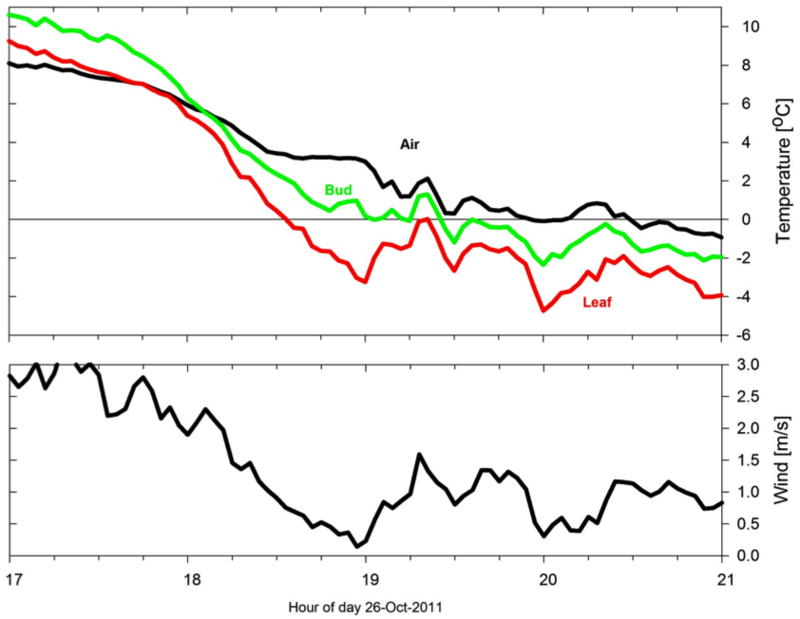 Figure 1: Leaf and bud temperature approximations measured with an Apogee SF-110 compared to air temperature (top panel) and wind speed (bottom panel) on the evening of October 26, 2011. Leaf and bud temperatures were both below air temperature after 6 PM (hour 18) and reached the freezing point well before the air. Kala, J., T.J. Lyons, I.J. Foster, U.S. Nair, 2009. Validation of a simple steady-state forecast of minimum nocturnal temperatures. Journal of Applied Meteorology and Climatology 48:624-633. Lhomme, J.P. and L. Guilioni, 2004. A simple model for minimum crop temperature forecasting during nocturnal cooling. Agricultural and Forest Meteorology 123:55-68.